The powerful manual Socom Elite tactical folder has been given a truly custom execution in this collaboration between Anthony Marfione and Sebastijan Berenji of Borka Blades. In addition to the stylish upgrades of bronze hardware and stingray skin handle inlays the beefy blade has been hand hollow ground by Sebastijan with his two-tone Apocalyptic Borka Pattern texture on the flats as well. This is a truly singular piece sure to enhance any collection. 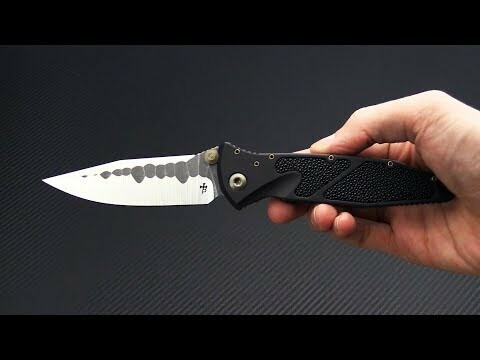 Blade: This Custom Socom Elite sports the same beefy 4-inch blade of high performance stainless steel but has been satin finished and hand hollow ground by Sebastijan of Borka Blades. The flats have also been finished with the dark, Apocalyptic Borka Pattern giving the blade a striking two-tone look. The blade is fast and smooth on a ceramic ball bearing pivot and is deployed via generous dual, bronze anodized thumb studs for decisive action. Handle: Constructed of durable aero-grade aluminum, the handles are both light weight and tough, finished in a black hard anodization for a discreet look. The standard traction inserts have been replaced with Ray Skin inlays elevating this custom piece while delivering a solid grip. The inset titanium liner lock mechanism delivers solid and reliable lock up and smooth operation thanks to the hardened steel insert. This Custom Socom Elite is completed with Bronze anodized Torx Hardware, right hand tip-down pocket clip and hardened steel glass breaker insert. Clip is marked with the Dagger Logo, "09/2018 U.S.A. 008" and both the maker's and designer's name.